When people talk about gulf access real estate in Bonita Springs they usually immediately think of of canals and the Imperial River. They forget all about Spring Creek. Spring Creek is one most over looked waterways in Bonita Springs. The interesting thing about Springs Creek is that it gets very little boat traffic and it is the paddler’s dream. Recently, while showing homes in Pelican Landing one of the buyers remarked that they were a standup paddleboarder. Of course, I shared that Pelican Landing has a kayak launch on Spring Creek and that it would be great paddling for an SUP (standup paddleboard). Honestly, it had been years since I paddled Spring Creek so this weekend I decided that I’d make the trip (with my dog, Slum Dawg Dillionaire) the length of Spring Creek and through the bay to Weeks Fish Camp which is at the end of Coconut Road. 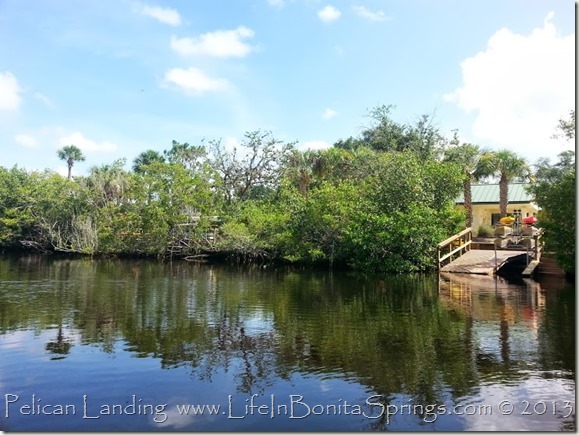 This trip basically turned into a great appreciation for the neighborhoods that actually border this waterway and I thought I’d share a little of what a kayak, canoe or SUP enthusiast might enjoy knowing about this area of hidden Bonita Springs. Off the record, there may be access to get to Spring Creek on the west side of US 41. Of course, there is no parking but there could be a way for a paddleboard to get to the water, just sayin’. Upstream the creek is well shaded and very private. You probably won’t see people unless it’s another paddler on the river. You will see tons of nature, wildlife, fish, dolphin, manatee, osprey and more. This trip I even saw a tarpon plus a snook about as long as my leg. Here’s how my trip went: I actually accessed the water from Cedar Creek with the help of a friend who lives there. 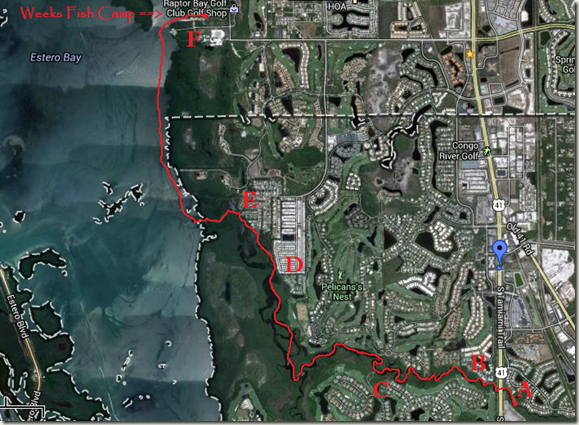 Cedar Creek has a canoe and paddleboard launch within the community that I’ve marked with the letter “A” on the photo. A short trip under the US 41 bridge and Pelican Landing is on the right hand side of the creek; in particular, The Pointe at Pelican Landing (marked with a letter “B” on the photo) which is a condo community that also has it’s own paddle craft launch. This is one of two paddle craft launches for Pelican Landing Residents on Spring Creek. There are a few lucky home owners that are creek front in the community of Bay Creek at Pelican Landing. On the left side of Spring Creek directly across from Pelican Landing is the community of Bonita Bay. Bonita Bay has a paddle craft launch on Spring Creek (marked with the letter “C” on the photo) and also has only a hand full of choice homes on the creek. There are tons of twists and turns in the river. There isn’t a lot of current up stream and it’s a wider waterway than you might imagine. When you get beyond Pelican Landing and Bonita Bay it opens up wider and you can easily make your way to the Springs Creek neighborhood area which is home to Spring Creek Village (marked with letter “D” on the photo) which is partly mobile homes with gulf access and the neighborhood of Spring Creek or “The Fish Streets” – aptly named because they’re named Redfish, Jackfish, Swordfish and so on. Fish Streets are marked with “E” on the photo. Depending upon the tide, the current can pick up considerably around the bend where Spring Creek Village ends and you’re close to the bay. After we powered up the exit of Spring Creek and hit the bay it was smooth sailing. 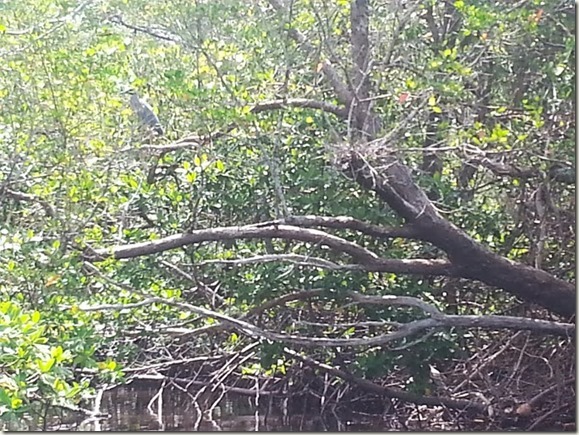 We headed north along the mangroves and on the path of the Great Calusa Blueway. Marker 16 is between Spring Creek and Week’s Fish Camp. You’ll probably see a fisherman or two working the mangroves while you paddle over to Weeks. If you’re not familiar with Weeks Fish Camp it’s at the end of Coconut Road near the Hyatt Coconut Point Resort Hotel (marked with letter “F”). There is a $5 parking/launch fee to use the Weeks facility. My car was parked and waiting at the marina. The entire trip was about two hours but I wasn’t exactly paddling hard plus I stopped a few times to give my dog a drink and to take pictures like this, a Night Heron building a nest. You’ll have to look closely to see them both, they’re pretty camouflaged. If you find the bird, the nest is parallel and to the right of it and looks just like a wad of sticks and branches. The nest is built over the water so it’s pass/fail for chicks. I would have never seen the nest if the bird wasn’t on it when I went by. If you end up paddling Spring Creek stop back and leave a comment and let me know how your trip was and what sort of wildlife you’ve seen. I'd love to hear about it. 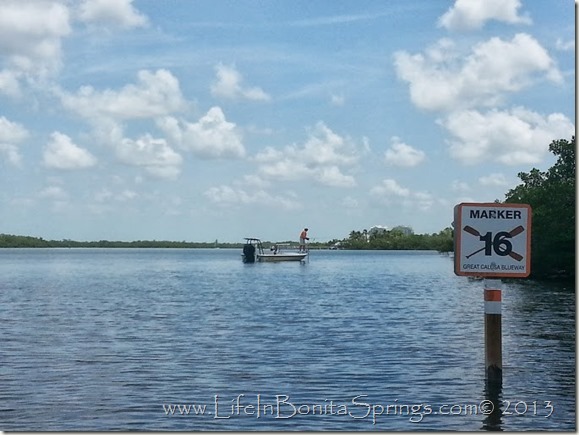 Also, if you’d like more info on living in one of these communities that offers small craft paddling access or other gulf access communities, give me a call or text 239-273-7430. 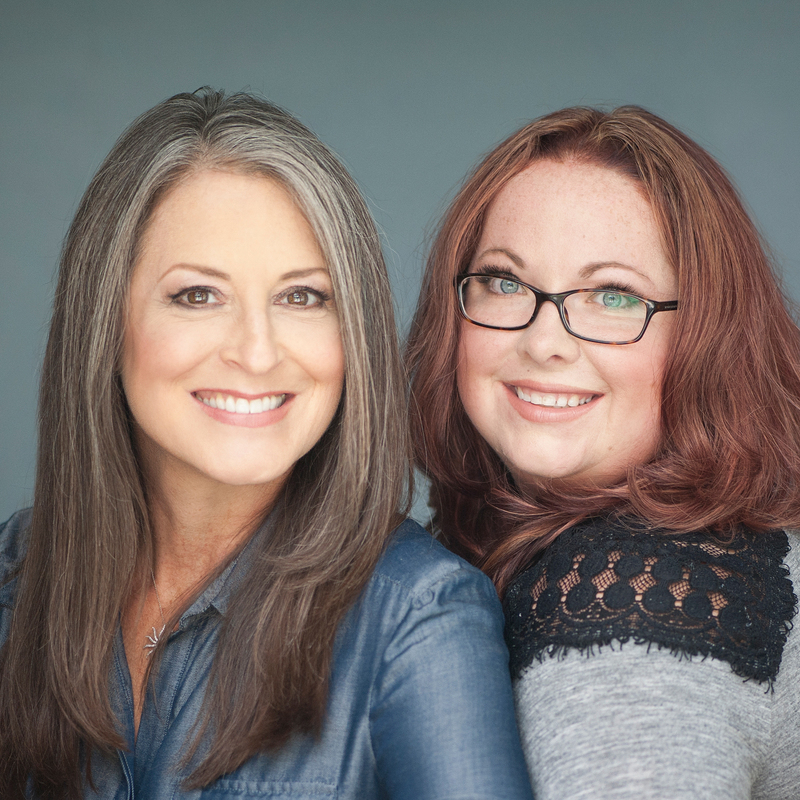 I’d love to be able to help get you closer to living on the water.